Only a few more days and everyone’s doorbells will be ringing as children flood the streets dressed in costumes in search of yummy goodness. To help you stand out from the rest of the neighbors, here are some of our favorite homemade Halloween treats. 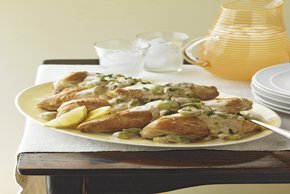 Whip up some of these and you will be the talk of the town. These chocolate cookies are scrumptious any time of year. But they're scrumptious AND fun when they're dressed as bats and cats for Halloween. Place half the dough on lightly floured surface; roll into ⅛-inch thickness. 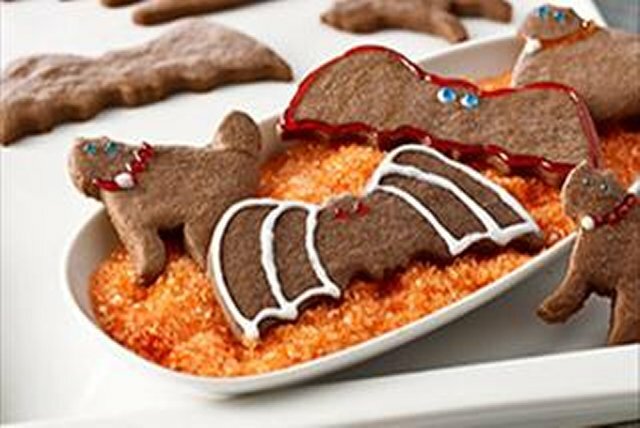 Cut into bat and cat shapes with 3-inch cookie cutters, rerolling scraps as necessary. Place, 2 inches apart, on baking sheets. Repeat with remaining dough. File these easy Halloween treats under ghoulishly delicious. 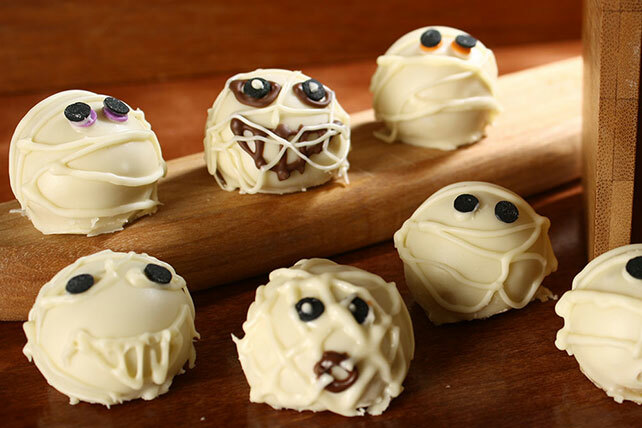 These ghost truffles and pumpkins have chocolate centers that are a treat to bite into! Microwave bittersweet chocolate, cream and butter in microwaveable bowl on HIGH 1-1/2 to 2 min., stirring after 1 min. Stir until chocolate is completely melted; cover. Freeze 1 hour or until firm enough to handle. Use teaspoon to scoop and roll chocolate mixture into 20 balls, each about 1 inch in diameter; place on waxed paper-covered baking sheet. Freeze 20 min. Microwave 3 oz. white chocolate in clean microwaveable 1-cup measuring cup or small bowl 1 to 1-1/2 min., stirring after 1 min. Stir until chocolate is completely melted. Set aside. Repeat with remaining white chocolate in separate bowl; stir in food colorings. Cool chocolates completely. Dip 10 chocolate balls in tinted chocolate, turning to evenly coat each ball. Return to baking sheet. Repeat with remaining chocolate balls and untinted chocolate. Decorate orange truffles with coconut to resemble pumpkins. Use decorating gel to draw eyes and mouths on white truffles to resemble ghosts. Refrigerate 30 min. or until chocolate is firm. Keep refrigerated. Cookie balls are famously easy-to-make treats—and these monster versions for Halloween are, too. They will be the new favorite at your Halloween bash! Shape into 48 (1-inch) balls. Freeze 10 min. Meanwhile, melt 12 oz. white chocolate as directed on package. Dip balls in melted chocolate; place in single layer on waxed paper-covered rimmed baking sheet. (Re-freeze balls if they become too soft to dip.) Refrigerate 1 hour or until firm. Melt remaining chocolate as directed on package; spoon into small resealable plastic bag. Press out excess air from bag; seal bag. Cut ⅛-inch piece from one bottom corner of bag. Squeeze bag to pipe chocolate onto each ball for the mummy's eyes; immediately add desired decorations for the eyeballs. Pipe remaining chocolate onto balls to resemble gauze strips. Refrigerate until firm. Have an incredible time this Halloween, stay safe, and make sure to save a few treats for yourself.